Norwich City were looking to kick-start their season, following two draws, and Chelsea were expected to take the points with relative ease. Didier Drogba started with Fernando Torres at Stamford Bridge and it was the Blues that came out flying. Norwich were stunned by Jose Bosingwa's early strike but managed an equaliser when Hilario fumbled at the edge of his area. 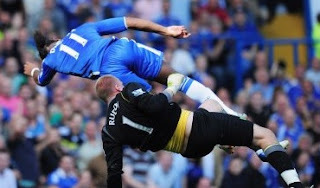 Drogba was stretchered off midway through the second half, before Canaries 'keeper John Ruddy brought down Ramires and was sent to the tunnel. Frank Lampard converted and and a very late Juan Mata goal rounded off another satisfactory - but not great - performance from a Chelsea side that looks better each week. Chelsea seemed in the mood for a rout this afternoon when Lampard's pass found Bosingwa in the sixth minute, which was duely buried from 30 yards. A cracking opener from the Portuguese and the Blues looked on the money, with Bosingwa regularly causing trouble on the right hand side - keeping his place after his assist in last week's win against West Brom. With Nicolas Anelka out the starting line-up, the other changes were Florent Malouda for Salomon Kalou and Branislav Ivanovic in for Alex. Norwich were light at the back and played three, allowing Chelsea's forwards way too much space. Drogba could have scored from Torres' through ball and the Canaries were preparing for the worst. However weak at the back, Paul Lambert's men began to trouble at the other end. Grant Holt coming agonisingly close when he got behind Chelsea's defence but couldn't connect. The first half ended with Norwich taking the game to Chelsea and they might have scored if it wasn't for some acrobatics from Hilario. John Terry forced a great save early in the second half but it was the visitors who found the net on the hour. Hilario and Ivanovic went to clear a Kyle Naughton lob, only to collide and allow Holt to hook the loose ball into an open goal. 1-1. Minutes later Norwich 'keeper Ruddy was punching to clear but connected with Drogba and put the rising Ivorian out cold. 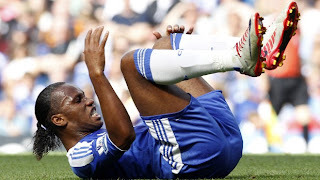 In the minutes that followed Mata was introduced in place of Malouda along with Anelka for Drogba; who was stretchered off for treatment. The Spaniard showed great flair whipping in a cross that Ruddy saved from Torres. Ramires should have scored but for the trailing arm of Ruddy who was given his marching orders. Substitute Declan Rudd (yep, really) had to contend with a Lampard penalty, which was buried with aplomb. Torres was replaced by Belgian new boy Romelu Lukaku who instantly provided pace and strength. Chelsea piled on the pressure and Lukaku headed just wide. With eleven minutes of added time almost complete, it was Mata who finished the Canaries off from a tight angle. Still not the most convincing of performances, but three points nonetheless. Mata and Lukaku should be delighted with their debuts, although there is still something missing in the middle... Drogba on the other hand, will undergo scans for any hidden injury but appears to have suffered concussion. Next up is a trip to Sunderland in a fortnight, after the international break.